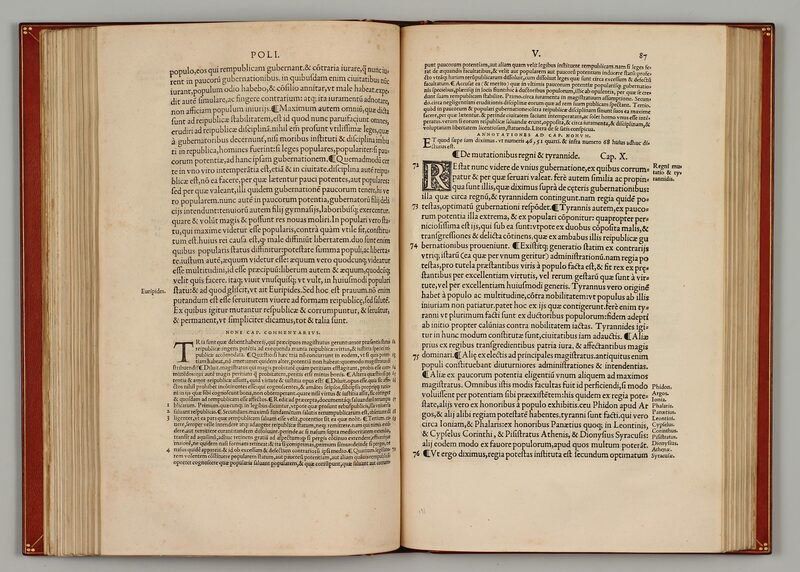 In Politica Aristotelis, introductio Iacobi Fabri Stapulensis: adiecto commentario declarata per Iudocum Clichthoveum Neoportensem. Item, Oeconomicon Xenophontis: a Raphaele Volaterrano traductum. 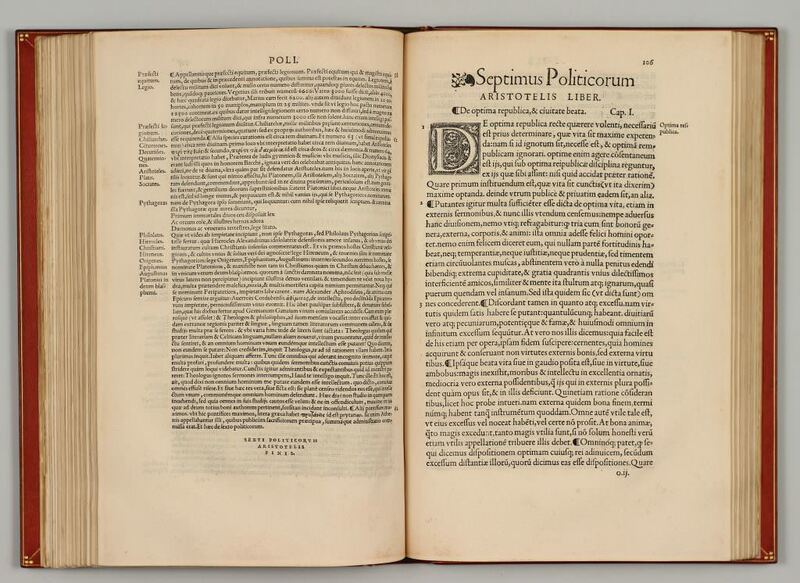 — Parisiis, Ex officina Simonis Colinaei, 1535. In hoc libro contenta. 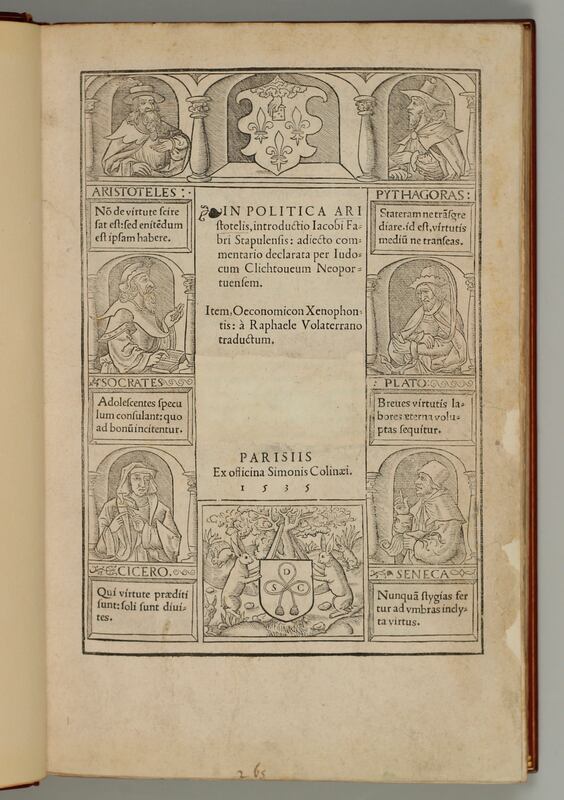 Politicorum libri Octo. Commentarij. Oeconomicorum libri Duo. Commentarij. Hecatonomiarum. Septem. Oeconomiarum publ. Unus. Explanationis Leonardi in oeconomia. Duo. 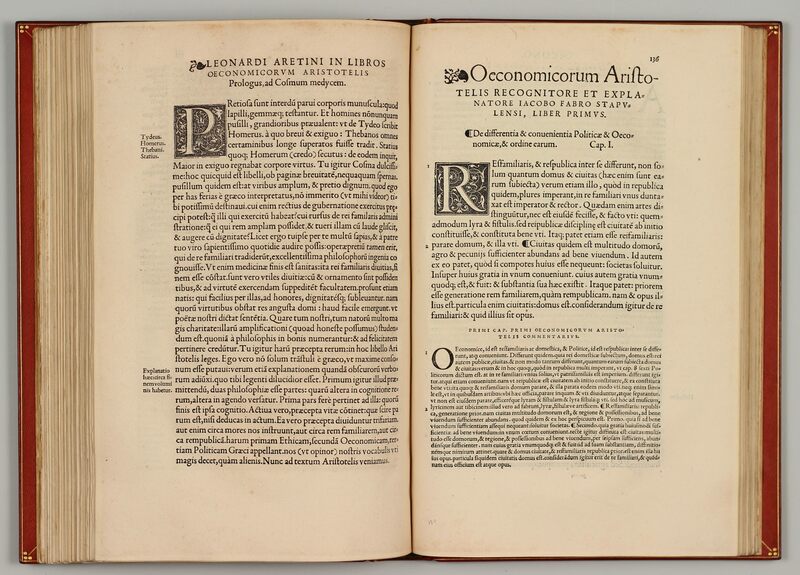 — Parisiis, Ex officina Simonis Colinaei, 1543. 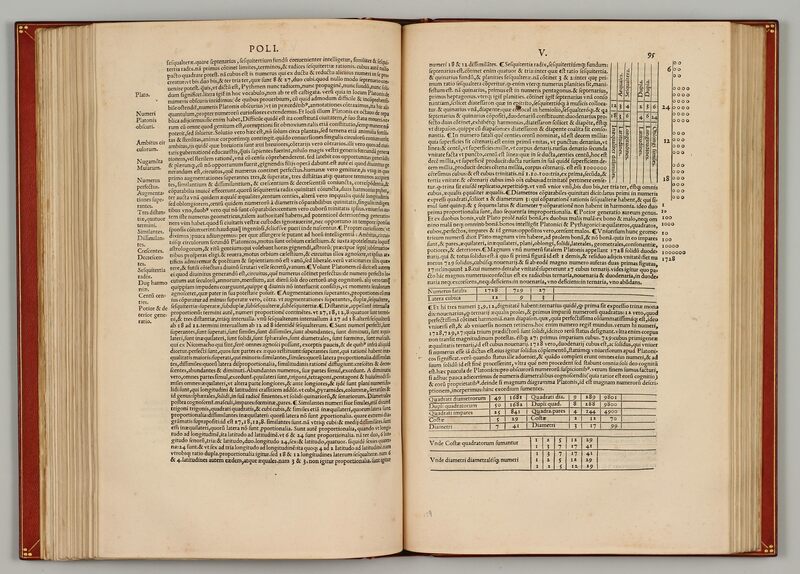 Folio (310 x 201 mm). A-D8 E6: 38 leaves; *6 a-z8 &.8 a.a.6: (6), 191 (i. e. 198) leaves. 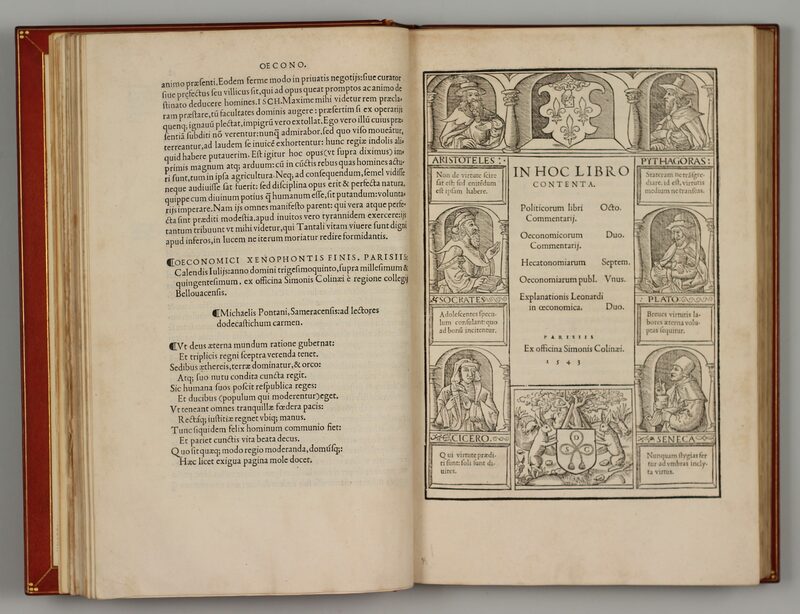 Both title-pages with Colines‘ Aristotle border: showing Aristotle, Pythagoras, Socrates, Plato, Cicero, Seneca, the arms of the University of Paris at the top and Colines’s rabbits at the bottom. Light foxing throughout. Outer margins of the first quire of the 1535 imprint repaired and old ownership-entry on title-page removed. 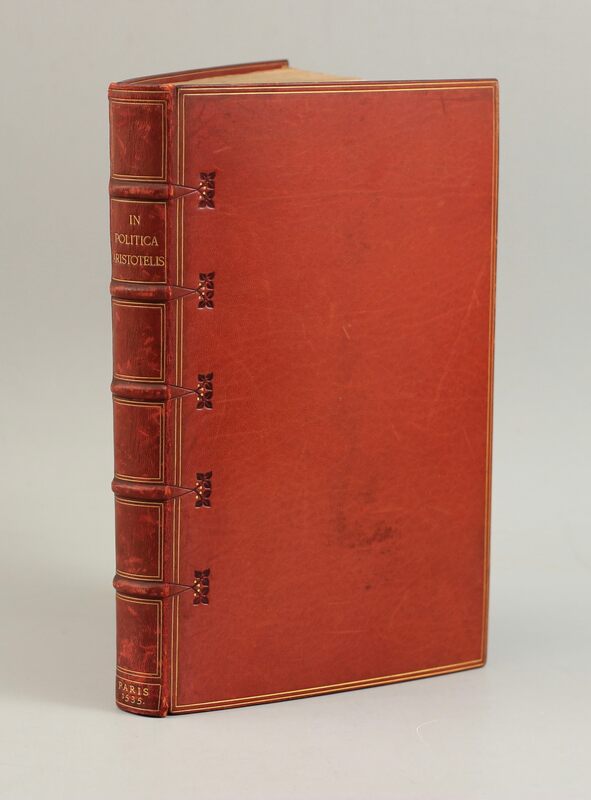 Modern red morocco binding, two gilt filets and a pattern of small leaves on both covers; stamp-signed in gilt with the W. H. Smith & Son Bindery monogram on rear turn-in. Back cover with a few scratches.